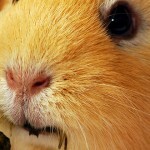 Most kind of snacks for Guinea Pigs are really fattening and should be leaved untouched. We explain why these products are harmful. [Auto translated] Most kind of snacks for Guinea Pigs like crackers, nibble / crispy sticks or anything like that should be leaved untouched in pet shops regardless how nicely the packages are designed and promising healthy. These products are fattening and could be a serious risk for many diseases in the long run. If you have a look at the ingredients list of this “food” you might be clear why these products can be very harmful to your Guinea Pigs and get an idea why you should leave products like crackers, sticks or anything similar untouched if you take care about your cavies – and you do so, right? There is a rule of thumb you can take your pick: The more and loud a package is colored, the more might this product be harmful. And it does make sense to clarify your family and friends about this to prevent well-meant but poor presents. 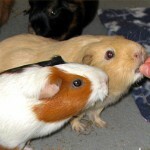 Tell them that a fresh head of lettuce is always a better present for your Guinea Pigs and they will love it as well! These kind of foods are rich in starch (amylum) and satiable. Starch will be transformed to sugar what causes gaseous or unusual fermentation. The pH-value descend and this provides best conditions for bacteria like e.Coli. The result is diarrhea and flatulence. These ingredients are far away from anything what kind of food Guinea Pigs need or find in their origin habitats. Like the starch sugar products descend the pH-value directly and may cause diarrhea and flatulence. 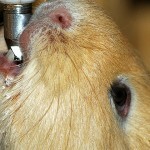 We have another detailed section for molasses at Pellets for Guinea Pigs. They are rich in fat. 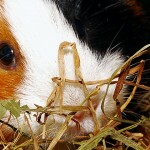 Due to it satiety your cavies might not eat enough hay and their teeth won’t be abraded enough. 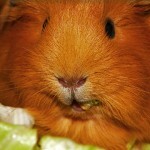 Malocclusion is a result and your cavies might refuse food completely in the long run. Guinea Pigs has nothing to deal with it. It is rubbish to feed herbivores like cavies with any kind of animal-by-products and it if far away from species-appropriate food. We hope this list of typical ingredients of snacks for Guinea Pigs explains clearly why it is always a bad option to by it however which vitamins might be supplemented in also. They are fattening and favoring diseases. If you feed them regularly with snacks their teeth won’t be abraded enough and you’ll get a lot of problems. Prevent in force-feeding! These products are often advertised to its “natural abrasion of the teeth“. This is a myth. Just have a look at our article about pellets / dry food for some more information. If you want to provide something for their “natural abrasion the teeth” simply provide natural products like hay of course – or small branches from walnut- or fruit trees. Additionally these products are often advertised to its supplements in “healthy vitamins” also. Oh dear! These supplements are strong sales angles but complete useless. Contrary there are always rumors about that too much of vitamins might be harmful too. If you feed them species-appropriate like declared in our food list they would never struggle with any lack of vitamins. Snacks are not healthy – snacks are the reason for many diseases. If you’ll try to feed snacks to prevent diseases you’ll open Pandora’s box. Be smart! Yes it can because spinach contains oxid acid and can result in digestive complaints. Do not provide too much of it. Hello! Hay is not sold in pet stores here or supermarkets. (I know in the US it is). I understand it’s grass hay. Is that different than what they feed horses? (I’ll have to search for it in Spanish.) There are horses here–but only dried alfalfa hay and leaves, and pellets for guinea pigs. What do I do if it doesn’t exist? I’m in Argentina. Plenty of veggie varieties– I don’t even know where to get horse hay…would fresh herbs be a possibility? Parsley, cilantro, thyme, oregano –any guidance would be appreciated: thanks!!. Feeding your pigs with hay for horses is no problem! It is usually the complete normal way! These products in pet stores are mostly for making money – not to feed your pigs as its best. can I feed my pig cat nip (fresh of course), what about parsley ( I grow these year around). Aso I live in FL so trees are primarily live oak. can I use southern maple brancges? or orange/lemon branches? I didn’t realize how bad the stuff from the pet store was!! What is nip? Do you know the biological name? Parsley – of course. Fresh or dried. Live oak contains tannin and may cause some serious problems. There are not much information out there about branches from lemon trees. I really don’t know, sorry. I contacted several horse breeders and they insist there is no hay(!) in the country (they feed horses dried alfalfa, oats and corn). My options are common vegetables (no sunchoke or endive), fresh common herbs (long stemmed parsley, cliantro are abundant), and pots of grass sold for cats…your help would be appreciated. Thanks!